What: Announcement of the candidates Rights & Democracy will support in the 2016 election, introduction of the Vermont Political Revolution Fund, and dance party. Join us for music from Dwight & Nicole, Myra Flynn, Chad Hollister, The Wee Folkestra, Craig Mitchell, Julie Winn, Radio Underground and other special guests and speakers throughout the evening. Why: Regardless of the outcome of the election, this historic, people-powered movement must continue to grow and work for change at the local, state, and national level. 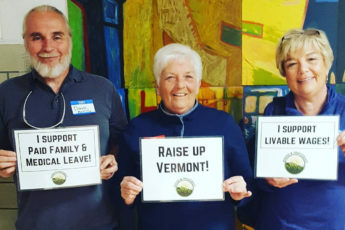 Here in Vermont, we have the opportunity to elect legislative leaders who will represent and serve working Vermonters, not just private, corporate interests and the wealthy. By bringing progressive voices into our State House, we can create our own political revolution. We are ready to join together and take back our democracy and demand economic, social, environmental, and climate justice.